Need to brush up on your social skills? 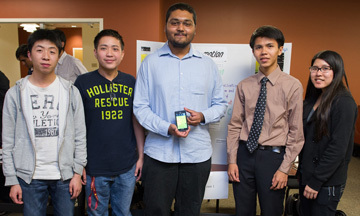 Bren School students have an app for that. 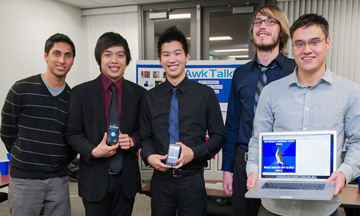 Following the theme of self-improvement, a team of UC Irvine undergraduates took home the latest AppJam Tournament grand prize of $1,000 with “AwkTalk,” an Android application that provides users with instant feedback on their social skills. 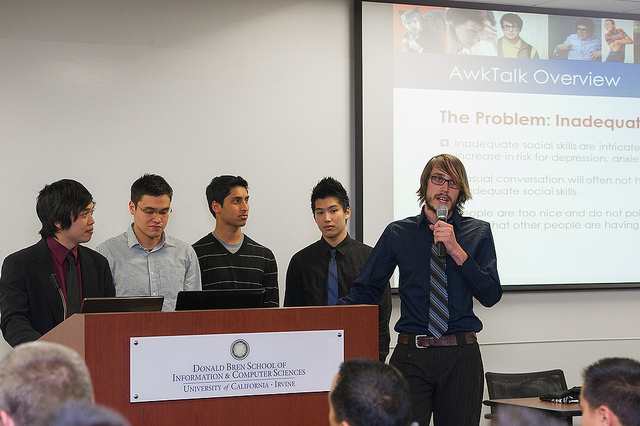 Created by Team Socially Awkward Anteaters, “AwkTalk” was one of 10 student inventions entered in the Winter 2012 edition of AppJam, a “build a fully functional app in a week” contest developed by the ICS Student Council. 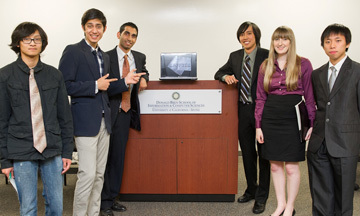 Teams included undergraduate and graduate students — as well as novice and advanced programmers — from the Bren School and other parts of the UCI campus. 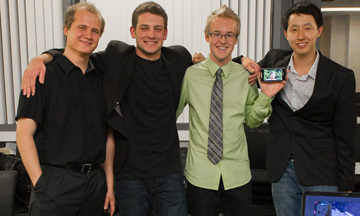 Second place and $500 went to the creators of “Learn UCI,” which provides voice-activated campus tours, while third place and $200 went to the team behind “Nappkin,” a mind-mapping application that allows users to note spontaneous ideas and receive insight from other users. “The theme of self-improvement really inspired the competitors’ creative sides,” said Jerry Huynh, president of the ICS Student Council, whose members created a web application — also in one week — that instantly compiled scores to make the judging process more expedient. 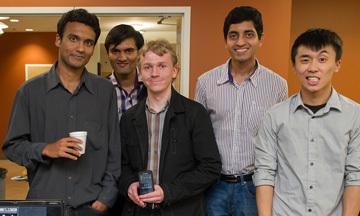 AppJam judges included faculty members Dan Frost, Shannon Tauro, Gu-Min Jeong and Nikil Dutt, as well as industry professionals Jason Leu of Kareo, Amir Banifatemi and David Cheng of K5, and Ed Cisek of MobilityWare. 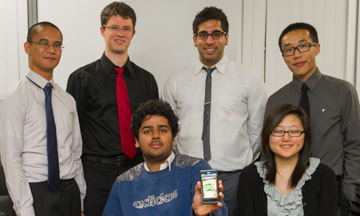 App description: AwkTalk provides users with vital feedback on their social skills. The app facilitates in-person meetings where two users participate in a timed topic discussion based on their preferences, then rate each other’s social skills through the app’s prescribed categories. 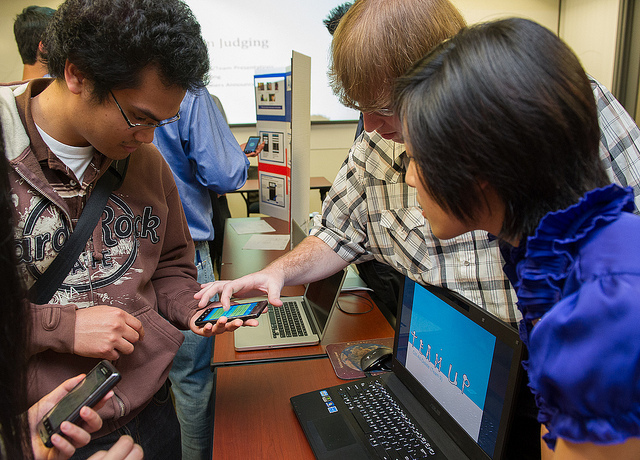 App description: Learn UCI, or LUCI for short, implements augmented reality and voice technology to give users the ability to take pre-loaded tours of UCI or upload their own custom tours. App description: Nappkin is a mind-mapping application that allows users to spontaneously jot down ideas as they come. With Nappkin, an intuitive interface allows users to create a “bubble” to be sent out to other users for insight. App description: eMotion is an attempt to reduce the stress caused by modern working and studying conditions. The app encourages users with mental and physical optimism, suggesting fitness breaks and providing mental humor breaks. App description: IdeaFactory helps to counteract issues with indecision by providing users with an interface to anonymously give and receive ideas. The app features a like/dislike rating system, categorical organization, and a calendar to provide dates and times for events. App description: Beak combines the social networking aspects of check-ins and events to create the immediate gratification of “Beak in and Meet up!” Through the app, users are able to invite friends to beacons (social events) in real-time. App description: ProveMe is a mobile app that allows users to join a support group for their personal goals; users set goals and join friends who share similar goals for motivation and encouragement. 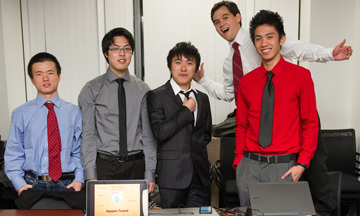 App description: Gamify utilizes gaming elements to incentivize users to accomplish personal goals. The app is inspired by the reward system of MMO role-playing games and includes Facebook integration. 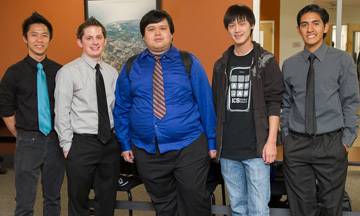 App description: Calo-Meter provides users with the caloric information of on-campus and nearby UCI restaurants. It also has a built-in pedometer to alert users how many calories they have burned. App description: TeamUp is a competitive and collaborative points-based self-improvement system where users set challenges as goals and vote on challenge difficulty.